TALBOT (Talbott), RICHARD, colonizer, office holder, and militia officer; b. 1772 in County Tipperary (Republic of Ireland), presumably a son of Edward Talbot and Esther Allen; m. 1795 Lydia Baird in Killaloe Diocese, Ireland, and they had five daughters and three sons, including Edward Allen* and John*; d. 29 Jan. 1853 in London Township, Upper Canada. Richard Talbot, a member of the minor gentry in Ireland, is believed to have descended from the Talbots of Mount Talbot in County Roscommon, a cadet branch of the Talbots of Malahide Castle [see Thomas Talbot]. A captaincy in the British army was purchased for him in 1783 and, from 1787 until 1790, he was a captain in the 5th Foot. He then served on half pay until 1795, when, prompted by his marriage, he retired from the army and settled in Garrane in King’s (Offaly) County. Over the next several years Talbot, generally in partnership with his brother-in-law Freeman Baird, purchased or rented a few parcels of land in both King’s and Tipperary counties. By 1800 he had moved from Garrane to Cloughjordan, in Tipperary. There he became an officer in the Cloughjordan Yeomanry and was commissioned commissariat officer in charge of payments to the widows and orphans of British soldiers who died during the Napoleonic Wars. As with many others of his class, Talbot suffered serious losses during these wars owing to the economic upheavals which beset not only Ireland but all of Europe, and, one suspects, because of his own mismanagement. These losses and the lack of opportunities for his two eldest sons, who had been educated for military careers, led Talbot to consider emigrating to Canada with his large family. Although by early 1816 he had been in correspondence with the colonial secretary, Lord Bathurst, on matters of emigration and government assistance, it was not until late 1817 that he was prepared to depart. Talbot, Francis Brockell Spilsbury*, John Robertson, and Thomas Milburn each led one of four groups to settle in Upper Canada under the £10 deposit plan of 1818. By the terms of this emigration plan, Talbot was to bring out and locate at least 10 settlers and would receive from the Colonial Office a grant in the proportion of 100 acres for each potential settler, after paying a refundable deposit of £10 per settler to ensure that the conditions would be fulfilled. While the expense of feeding the emigrants was to be borne by Talbot, the government undertook to have the lands granted free of expense and to provide the necessary means for the Atlantic crossing. Many hardships were to plague Talbot and his settlers owing to the ambiguity surrounding many aspects of the plan, the lack of foresight on the part of the British government, and Talbot’s own incompetence in carrying out the scheme. The 183 individuals who comprised his group, predominantly Anglicans from Tipperary, sailed from Cork in mid June 1818 on board the Brunswick. By the time the party had reached Prescott, Upper Canada, however, only about half that number were still under the leadership of Talbot and his eldest son, Edward Allen. Most of the disgruntled settlers who had left the group with their families were ultimately located by Deputy Quartermaster General Francis Cockburn* in the townships of Goulbourn, March, and Nepean in eastern Upper Canada. 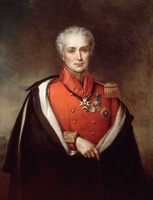 Arriving at York (Toronto) on 9 September, Talbot met the new lieutenant governor, Sir Peregrine Maitland, and most probably his kinsman Colonel Thomas Talbot. From the former he received the promise of a personal grant of at least 1,000 acres of land, in place of the Colonial Office’s proposal, if he agreed to allow his remaining settlers to be located by the provincial government under the normal terms for settlement. From the latter he learned of the choice lands available under the colonel’s supervision near the forks of the Thames River, in newly opened London Township. About 70 settlers followed Richard Talbot to this township. In 1819 and in succeeding years they were joined by relatives, friends, and former neighbours to form a very successful settlement, which soon spilled over into the neighbouring townships to the north and east. Although his settlement was a success, Talbot personally experienced both social and economic failure. 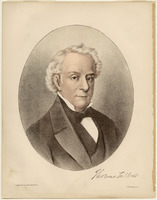 At the first town meeting, held on 4 Jan. 1819, he was elected one of two assessors, not the most important office within township government, and his name is conspicuous by its absence from the minutes of subsequent meetings. Though appointed a captain in 1823 in the newly formed 4th Regiment of Middlesex militia, he was the last of the six captains listed. Finally, although satisfactory candidates for appointment as justices of the peace were scarce, Talbot, in spite of his background in the Anglican gentry and the military, was never made a magistrate, the mark of the squire he envisioned himself to be. Within a few years of his selection in 1818 of 1,000 acres on some of the best land in London Township, he had built Mount Talbot, which was more pretentious than the original dwelling he had built there. He was nevertheless totally unsuited to the life of a country gentleman. The several servants he had brought with him from Ireland had left his employ, his two eldest sons had left the area (at least temporarily), and as early as 1823, according to Edward Allen Talbot, his health was “fast declining.” Moreover, by 1825 he had sold off his entire 1,000-acre grant, partly to reduce the indebtedness resulting from his financial mismanagement, partly to support his eldest son’s family and ventures, and partly to attempt, unsuccessfully, to promote another emigration scheme. Finally, in 1836 he sold to George Jervis Goodhue* and Lawrence Lawrason* the additional 200-acre lot which had been allowed him in 1822 in the northern part of London Township. Talbot, his wife, and unmarried daughters continued to live at Mount Talbot, which had been sold to Edward Allen Talbot in 1823, until some time after 1842. He and his wife then lived with their youngest son, Freeman, in what is now the northern part of the city of London. It was there that Talbot died in 1853, a week before the death of Colonel Thomas Talbot. PAC, RG 5, A1: 29967–69, 30292–94, 30355–58, 30375–77, 86779–82. Private arch., D. J. Brock (London, Ont. ), Letter from Bruce Elliott, 9 Oct. 1979, and enclosures, containing geneal. information. UWOL, Regional Coll., F. B. Talbot papers. E. A. Talbot, Five years’ residence in the Canadas . . . (2v., London, 1824; repr., 2v. in 1, East Ardsley, Eng., and New York, 1968). G.B., WO, Army list, 1788, 1791, 1795. “State papers – U.C.,” PAC Report, 1896: 70, 77; 1898: 217. D. J. Brock, “Richard Talbot, the Tipperary Irish and the formative years of London Township, 1818–1826” (ma thesis, Univ. of Western Ont., London, 1969). H. I. Cowan, British emigration to British North America; the first hundred years (rev. ed., Toronto, 1961). F. T. Rosser, London Township pioneers, including a few families from adjoining areas (Belleville, Ont., 1975). Daniel J. Brock, “TALBOT, RICHARD,” in Dictionary of Canadian Biography, vol. 8, University of Toronto/Université Laval, 2003–, accessed April 20, 2019, http://www.biographi.ca/en/bio/talbot_richard_8E.html.